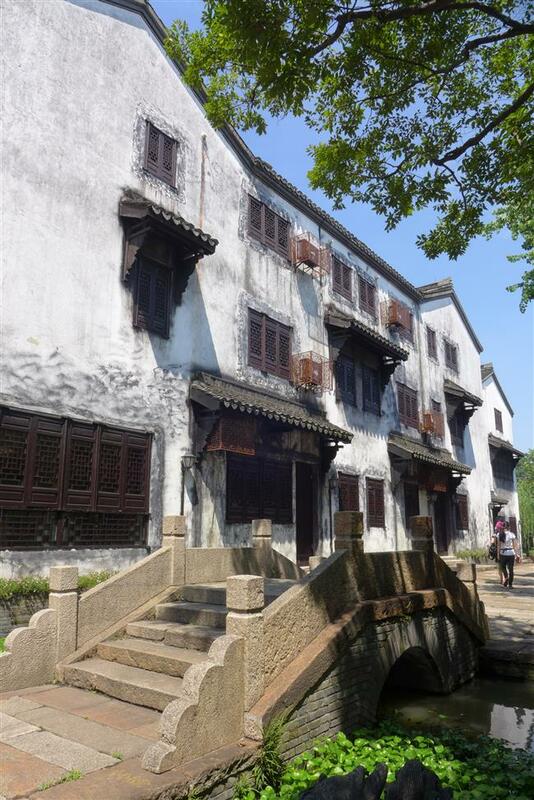 Jiaxing in Zhejiang Province may be modernizing but there are areas that still retain a bit of old history and culture that visitors find attractive. In Meihuazhou, buildings in old Chinese style stand by the rivers flowing peacefully underneath stone bridges. 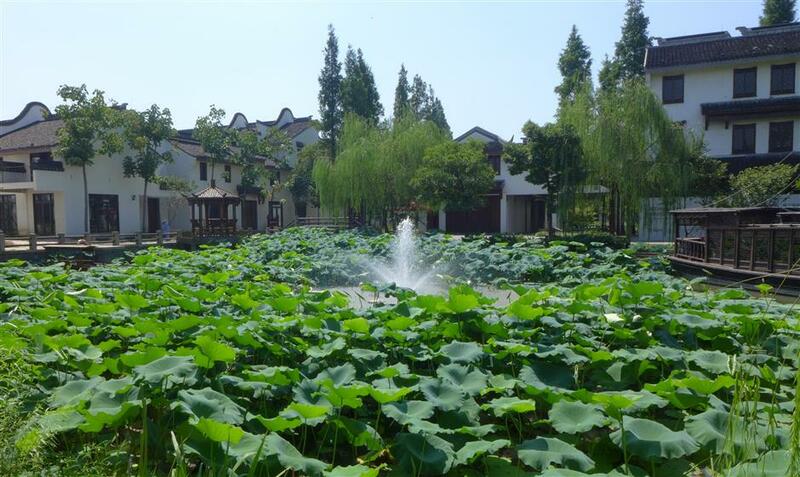 Jiaxing, in Zhejiang Province, is only an hour's drive from Shanghai but shows a much slower pace of life. Known for its history, culture and picturesque scenery, the ancient city owes much of its reputation to famous places like Meihuazhou (literally plum blossom islet), the Moon River area and Xitang watertown. Meihuazhou, sitting on a sprawling, twisting river, has a museum devoted to Jiaxing’s culture, while Moon River and Xitang boast shops, restaurants, and sights that are unique to the town. The terrain of Meihuazhou is divided into five territories, resembling a titular plum blossom. Bridges connect the areas separated by water. Kirin statues decorate the pathways as they represent luck and fertility. A small man-made waterfall is on the side of the entrance, and artificial fountains, surrounded by lily pads, sit in the natural lakes. As visitors make way to the main street, the village transform into its original appearance. 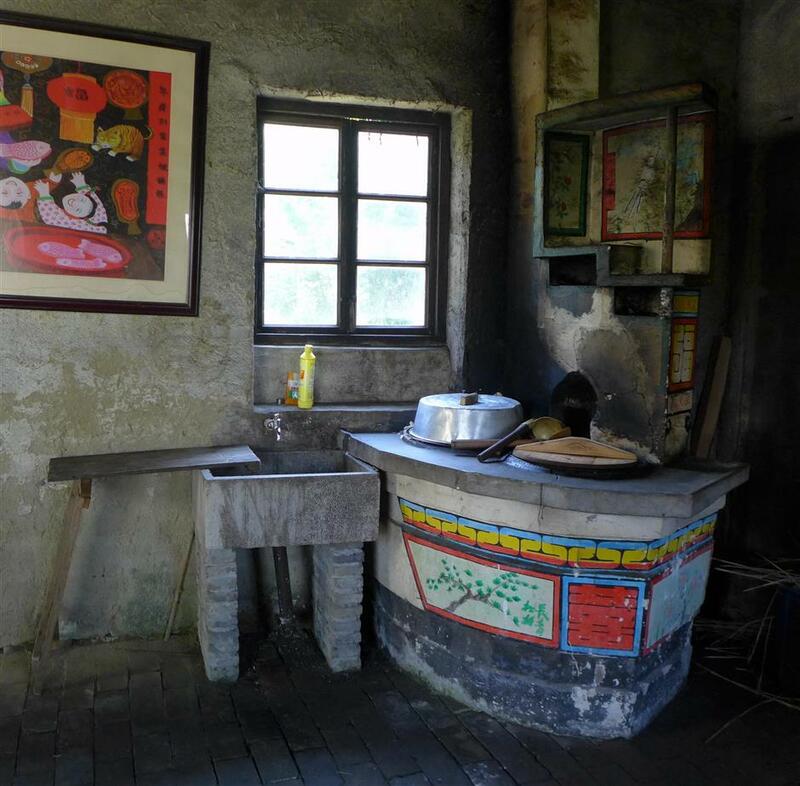 Tucked away in Meihuazhou are some buildings with old-style kitchens — a stove, a few pans and some tea pots. 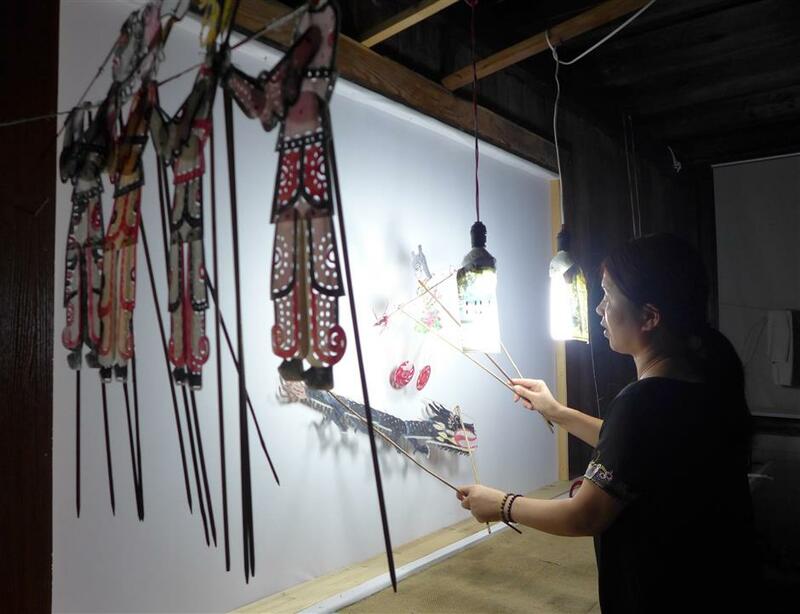 Shao Yan, a native of Anhui Province, presents a shadow puppet show in Meihuazhou. There are buildings with old Chinese-style architecture along with the rivers flowing peacefully underneath stone bridges. Across one bridge is an open field of lush grass that leads further into the village. A sight to behold is a large 1,240-year-old tree sitting on the field. Venture further into the village, and you’ll find a garden filled with vegetables and surrounded by buildings with kitchens reminiscent of the kind that were found in old time — a stove, a few pans and some tea pots. Visitors can pay the locals to pick vegetables from the garden and have them cooked. Exploring further, you will find a large Buddhist temple and a Chinese shadow puppet theater. Each building in the area offers an insight into the history of the place, from local marriage customs to wood carvings. Compared with Meihuazhou, the Moon River area, 30 minutes' drive away, is a more traditional vacation experience. It gets the name from the local canal system that has a shape like a crescent moon. 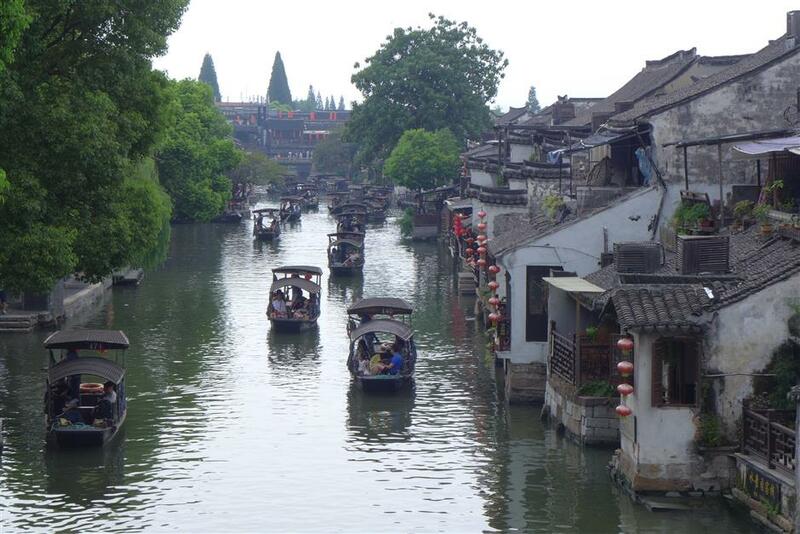 Moon River is similar in size to Meihuazhou, but smaller than the other water towns in Jiaxing such as Xitang. It used to be a prosperous neighborhood in the olden times. The entrance to Moon River is marked by rows of stores and restaurants. Bridges connect the land separated by crisscrossing rivers. Once you traverse the largest bridge in Moon River, you arrive in an open courtyard. The Moon River area gets the name from the local canal system that is shaped like a crescent moon. Old streets at Moon River exhibit local culture. 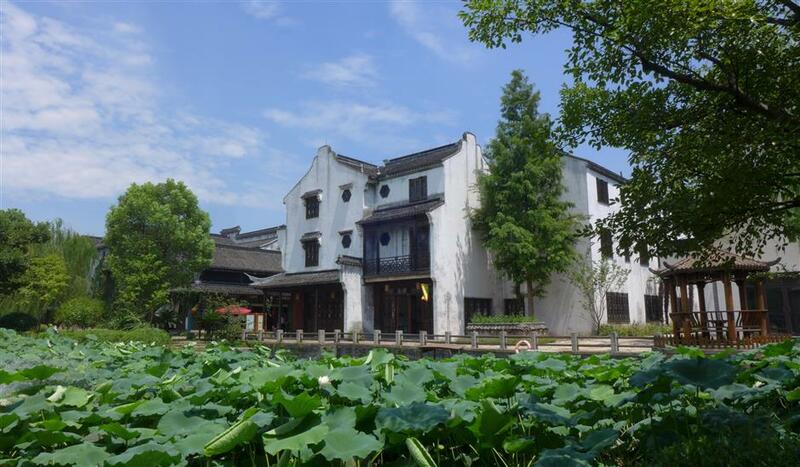 The Museum of Zongzi Culture at Moon River is devoted to the pyramid-shaped rice dumplings which Jiaxing is famous for. On both sides of the courtyard are two paths which are filled with shops and bars and exhibit the local culture. One standout display is the Museum of Zongzi Culture where visitors can learn the history and preparation of zongzi, or pyramid-shaped rice dumplings, that Jiaxing is famous for. The shops sell varied goods, ranging from traditional Chinese garbs to obtuse musical instruments like the ocarina. Restaurants there serve local food. The water town of Xitang, about an hour away from the Moon River, is similar in style and has a tourist appeal. Spread over 250,000 square meters, it boasts more expansive waterways and architecture. The prosperity of Xitang was partly due to its proximity to the ancient silk trade route on the Grand Canal. The winding paths of Xitang can lead to scenic sights or dead ends. 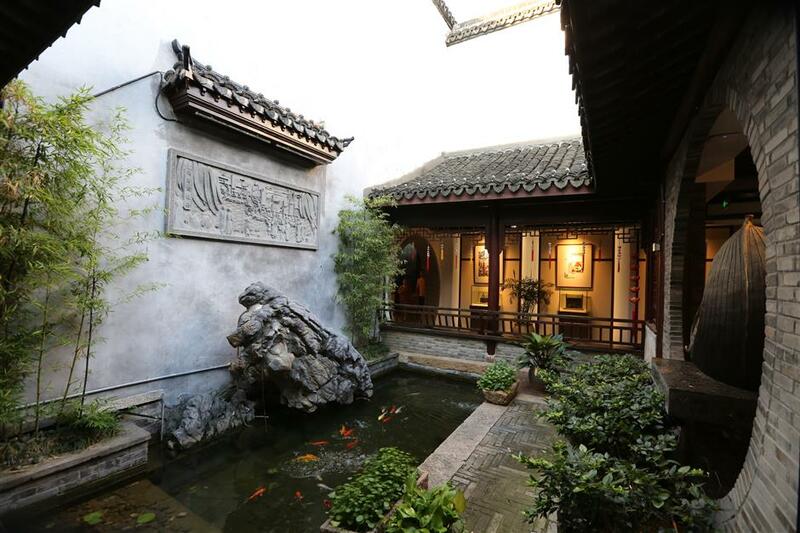 Occasionally the paths are broken up by open courtyards where one can enjoy the breeze and soak in the backdrop of the water town. The courtyards are packed with tourists while young art students and artists paint the landscape. 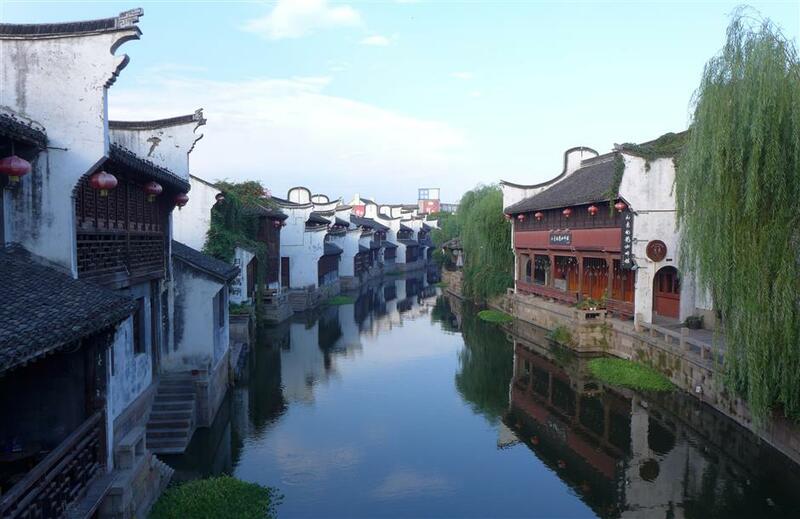 The water town of Xitang boasts more expansive waterways and architecture. 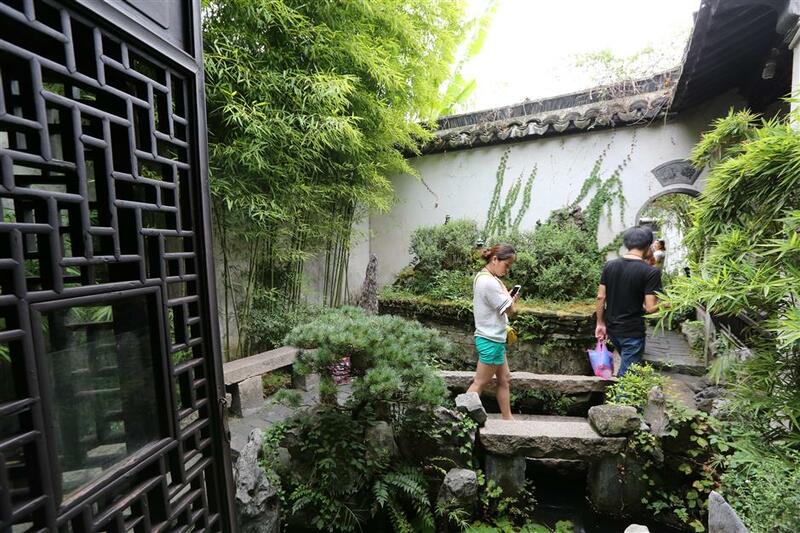 Tourists visit a garden-style building in Xitang. 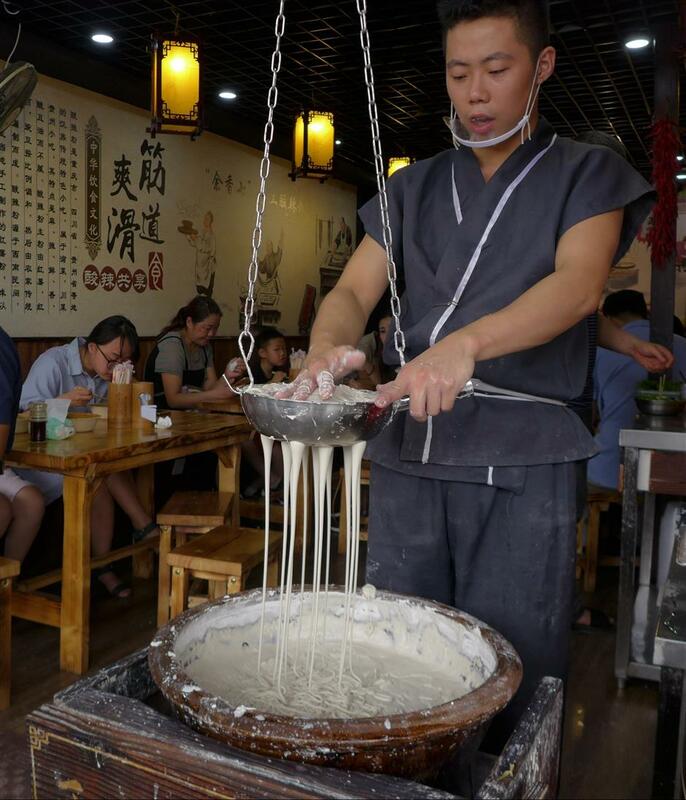 A man makes potato noodles in a traditional way in Xitang. Xitang feature buildings with tiled roofs commonly seen in water towns. The houses are usually two stories with white walls decorated with red Chinese lanterns and black roofs. Complementing the architecture are the towering trees and green flora that dot the streets. Rivers in Xitang are not only home to plant life but also tiny fish that, if looking closely, can be seen jumping out of the water. Alongside the fish are boats that slowly sail down the rivers. While the goods on sale in Xitang are similar to those at the Moon River, here you can really see the merchants at work — either vendors craft their stock or cooks pound the dough into noodles. Despite the large crowd, Xitang still has an air of coziness. From the leisurely pace of its visitors to the relaxing sight of sunlight reflecting on the water, there is never a feeling of being overwhelmed by the massive size of the town. How to get there: It takes only about half an hour by high-speed train from Shanghai's Hongqiao Railway Station to Jiaxing. If you drive, it takes about 75 minutes via G60 (Shanghai-Kunming) Expressway.